Hours of Operation: 7 days a week, 6 a.m. – 12 a.m. • Shop Hours: Monday – Friday, 9:00 a.m. – 5:00 p.m. & Saturday, 10:00 a.m. – 3:00 p.m. If it locks, we fix it. With the hustle and bustle of life, you may forget your keys. 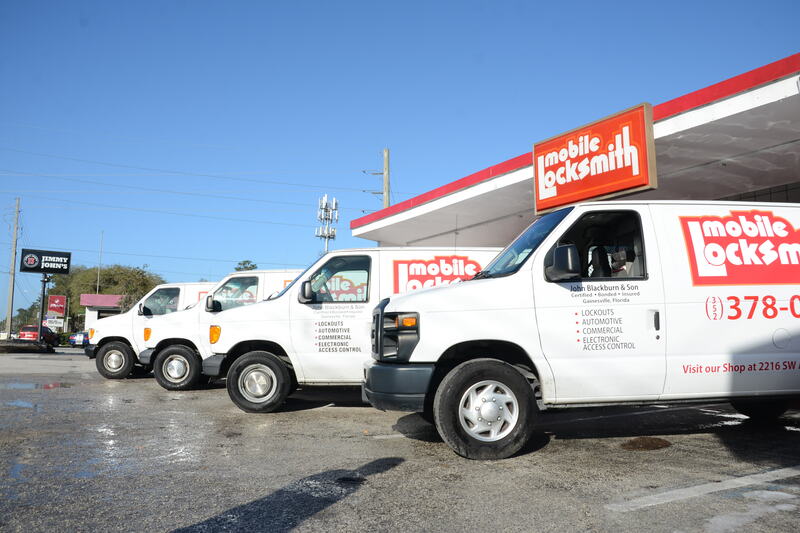 Whether you're locked out of your home, car, or business — Mobile Locksmith can help. 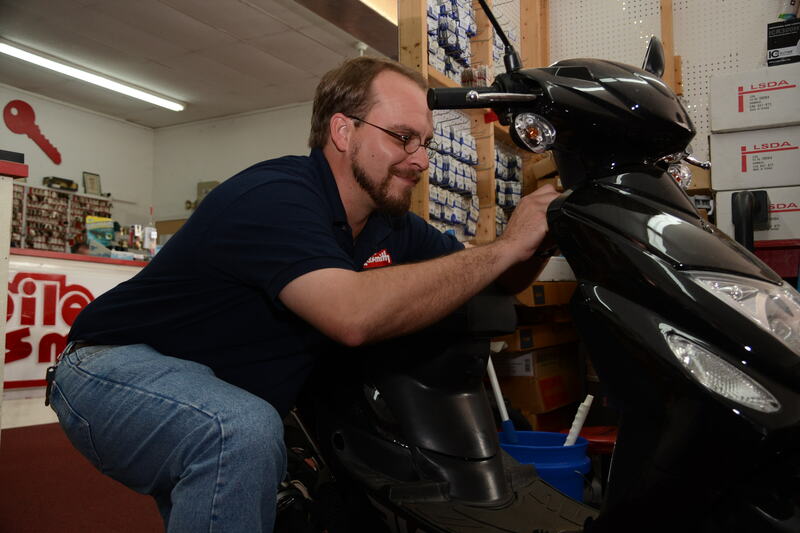 We proudly serve a 100-mile radius of Gainesville, Florida. Contact us today for more information. Residents of North Central Florida have been trusting our services since 1979. Whether you are locked out, need to rekey your house in a hurry, or need a safe to protect your important documents, we have you covered. We proudly serve a 100-mile radius of Gainesville, Florida. Contact us today for more information. We make keys for most cars foreign and domestic. We sell and program keys, fobs, and remotes for most models of cars, including those from Asia and Europe. 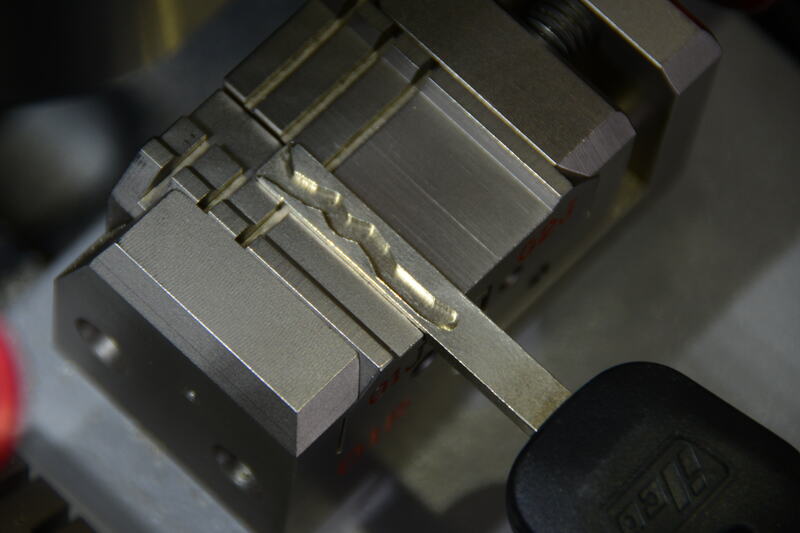 We maintain the latest software and machines to enable us to cut Hi-Security keys including sidewinder (laser-cut) keys. We also program fobs for push-button start cars. 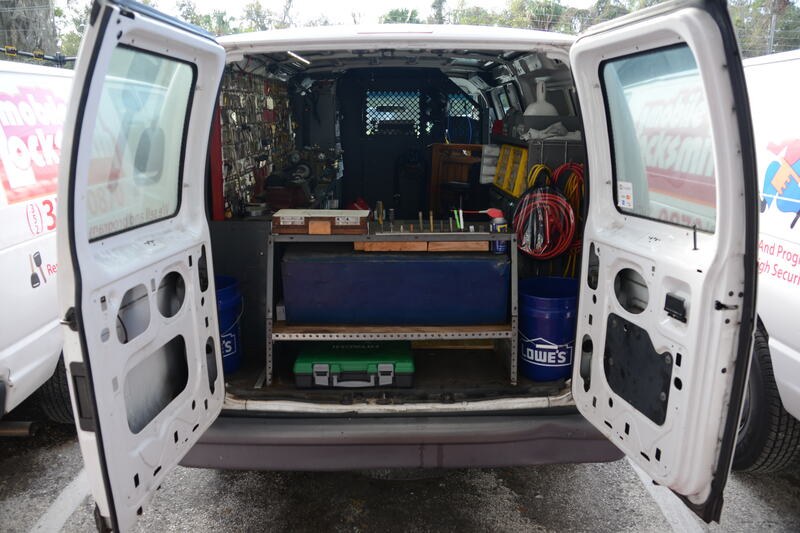 We repair and rekey automobiles in the event that the keys have been stolen or compromised. 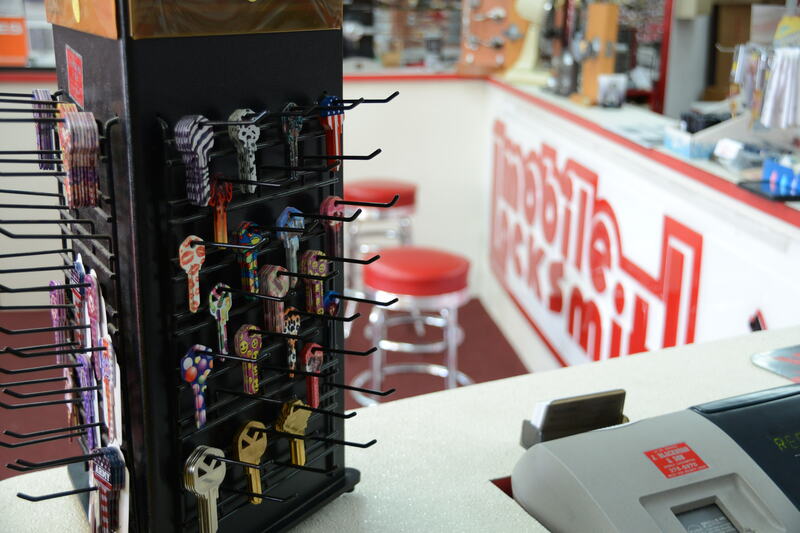 If you've lost your keys, or you're locked out of your car or home — Mobile Locksmith can help. 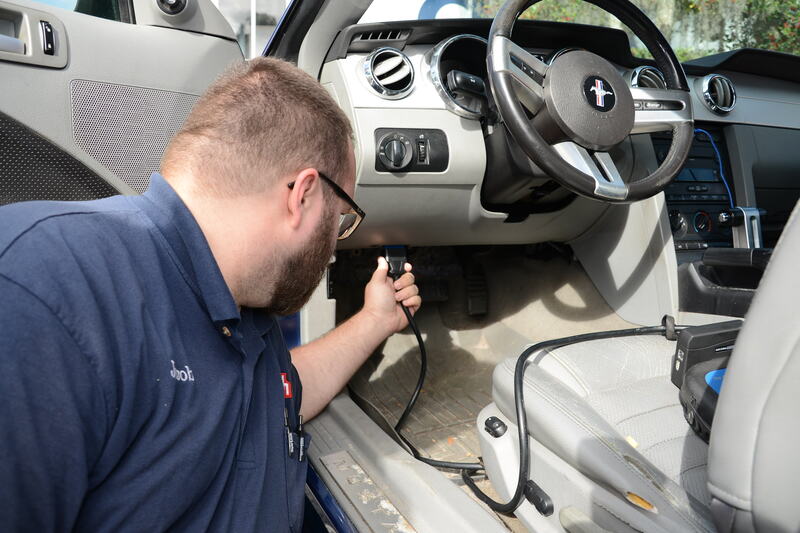 We want to do everything that we can to make sure that your specific needs are met and that your vehicle isn't damaged during the unlocking process. Located in Gainesville, Florida, we serve customers as far away as Leesburg in Sumter County and Jacksonville in Duval County. Our estimated time of arrival depends on your location, and our daytime service call rate starts at $50 in Gainesville and increases with distance. 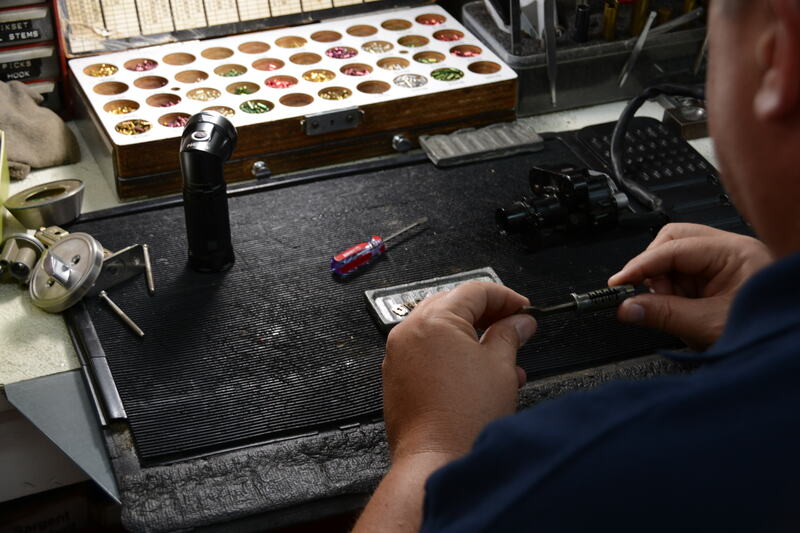 If someone has keys to your house or business who shouldn't, you need to rekey your locks. This involves taking your locks off of the door, taking them apart, and changing the pins inside to fit a completely new key. Your old keys will no longer work, and you can now distribute all of your new keys to your family members or employees. Call us anytime and we will work with your schedule to meet you and perform this necessary service. For home or work, security cameras help you maintain control of your space. We install and replace cameras that already exist, as well as install fresh cameras, run wire, and make the job look professionally done. We can install and service both CCTV and IP (Internet) camera systems. In addition to providing integrated access control solutions, we also install or replace electric keypads. Combinations get lost. Hardware can fail. If you find yourself locked out of a safe or strong box, we can help. We sell the top quality, fire and burglary rated safes for homes and businesses. Whether you need a drop safe for cash at your restaurant, or a gun safe for keeping your children safe, we can help. We sell and install all of the top brands of safes sold today. If you are in the market for a safe, come into our shop and let us get you one that will fit your specific needs. On the road or in the shop, we have a plethora of key blanks for almost anything. 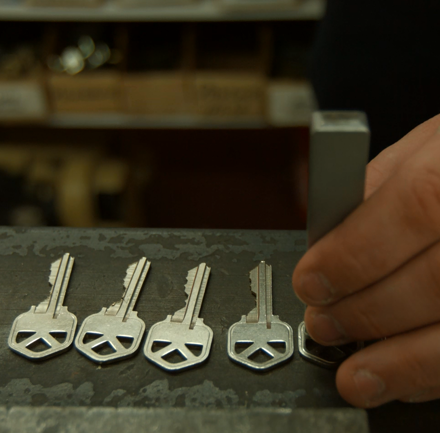 From simple house keys to Sidewinder (Laser Cut) keys we make them all. We keep up with the latest technology for programming hi-security keys to all of the latest models, including foreign cars from Europe and Asia. 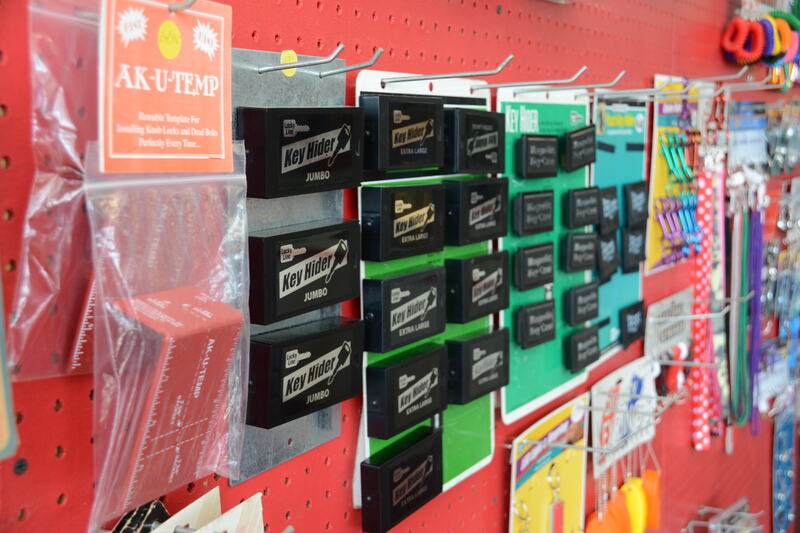 Our shop carries hundreds of keychains, hide-a-keys, lanyards, specialty key blanks, and much more to differentiate your keys from one another or fit your personality. 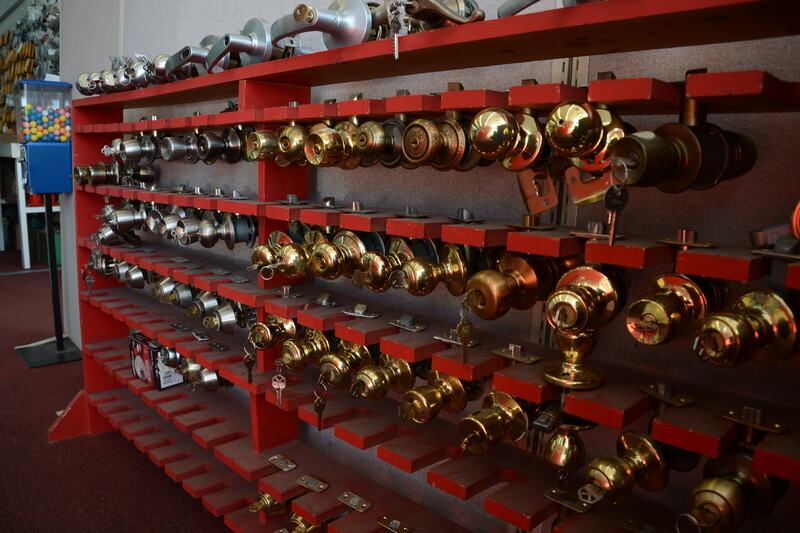 For new doors or doors with existing holes, we sell and install knobs and levers of any brand you can imagine. Homes, Businesses, Cars, Trucks, Trailers. Wherever you are, whenever it happens, we will be there to get you back in and get you on your way. We take great care to ensure no damage is done to your house or car in the process. If your keys are lost you will need new keys made to your car. We can both originate new keys and reprogram your car so that the old keys will not work. This process usually comes with two new keys and can be done anywhere you are.